Welcome to Glenfalloch – a tranquil garden for all to enjoy. Glenfalloch Woodland Garden is owned and operated by the Otago Peninsula Trust New Zealand’s first private charitable conservation trust, established in 1967 to preserve and enhance Otago Peninsula. Your support of the garden and restaurant enable the Trust to carry out its conservation objectives and share Otago Peninsula’s special places with all our visitors. In 1969 Glenfalloch was the first property bought by the Trust to save for all visitors to enjoy. Rave reviews for Glenfalloch Restaurant with renowned chef Hannes Bareiter and his partner Melanie Hartmann, as Glenfalloch is one of the top 10 restaurants in Dunedin. Hannes’ exciting ‘Trust the Chef’ degustation dinner menu has lead Glenfalloch’s popularity, with guests using phrases like ‘taste explosion’, ‘first class’ and ‘5 course, 5 Star’. Glenfalloch Woodland Garden, Gaelic for ‘hidden valley’ is an historical garden – tranquil, beautiful, much loved and treasured by visitors. Glenfalloch is a garden of four seasons. 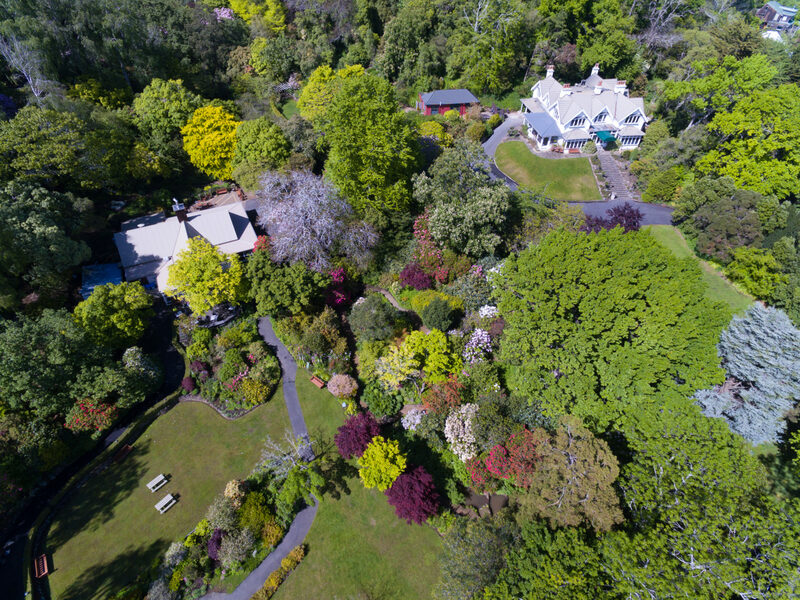 Magnificent English Beech, Oak, Ash, Walnut, Elm and Horse Chestnut trees complement the indigenous New Zealand native ferns, Kowhai, Rimu, Pohutakawa and Cordylines planted to advantage by the original owner. The aging dry stone walls accentuate the garden structure in artfully arranged beds, maximizing seasonal colour combinations, form and texture. Spring at Glenfalloch is spectacularly impressive. Tulips, Daffodils, Rhododendrons, Azaleas and Japanese Flowering Cherries dominate, with drifts of English Bluebells, Snowdrops, Primula Candelabra and wild Primroses around every corner. Summer presents an enchanting collection of flowers and foliage. Hostas, Penstemons, Hollyhocks, Lavender, Gunnera, and a Heritage Rose Garden accompanied by the constant whisper of the Windflowers welcome busloads to this unique magical wonderland. Autumn and winter is a leafy tapestry of colour, brilliant reds, orange, yellow and bronze boldly provided by numerous varieties of Maples, Birch, Rowan trees and an extensive collection of Fuchsias thrive in a unique micro-climate. The original Homestead and fountain stand proud at the top of the sweeping lawn where the driveway swirls up and around the front ‘Alfred Buxton’ style. The original Glenfalloch is at the head of Loch Lomond in Dumbartonshire Scotland. Its name-sake, on the Otago Peninsula, is situated on the harbour side 9km from Dunedin’s City centre. The land was originally part of a much larger holding owned by the well-known Macandrew Family, after which the neighboring suburb is named: James Macandrew was the first Superintendent of the Otago Province. 1871 One hundred acre block purchased by George Gray Russell. 1956 James purchases Glenfalloch and opens gardens to public. Queen Mother visits. Glenfalloch’s original one hundred acre block was purchased from the Reynolds and Macandrews by George Gray Russell in 1871.Russell was a great “tree” man and planted out a good deal of his 30,000 acres in Radiata Pines with trees 2 feet tall to a density of 500 per acre. The Government incentive subsidy then was 2 extra acres of land given for every one planted. He is credited as being one of the founders of the Pine timber industry and perhaps the first person to plant Macrocarpas (Monterey Cypress) in New Zealand – a fine example of which can be seen at Glenfalloch above the “Potters Cottage” beside the bushwalk. Richard St Barbe Baker founder of the “Men of the Trees” movement claims this to be the oldest, finest and straightest specimen in New Zealand. Russell set about building his Gentleman’s Country Residence at Glenfalloch in the early 1870’s. Most of the timber and building materials were brought by boat to Macandrews jetty in the bay and then by dray, or sledge down-hill from the high road, which was put in by Larnach as access to “The Camp”, better known locally as Larnach Castle, which was nearing completion. Compared with Larnach’s grandiose Victoriana – Glenfalloch was to be a most modest building. Constructed of Kauri and Baltic Pine it comprised 5 dormer bedrooms, dressing room, bathroom, box room and maids quarters – upstairs. The sitting room, smoking room, dining room, breakfast room, morning room, wine cellar, pantry, kitchen and bathroom were all on the ground floor – a great deal of which has been altered over the years, Russell employed “Godfrey” the English master carver and moulder to do some work for hem and his ceiling centre and mantle are still in place in the sitting room. Most of the Peninsula by this time had been cleared of its native forest cover through milling and fire which swept through it unchecked for days, but thanks to George Russell’s foresight and love of the trees there are beautiful specimens on the property still. Some of the older Redwoods, oaks, elms, ashes etc., and the macrocarpas at the back of the property were planted in the 1880’s to 90’s, the younger trees after 1920. One surviving native Podocarp goes back a little further than these dates; it’s a Matai or Black Pine which can be seen above the main bush track to the South West, opposite the Pottery Cottage, estimated by Richard St Barbe Baker as around 1000 years old. George Russell’s main business venture when he finally took up residence in 1876 was the establishment of one of New Zealand’s oldest mercantile firms “Russell Ritchie” later to be known as National Mortgage then Wrightson NMA. Access to and from the harbour side settlements of the Peninsula was severely restricted in these early days. The long, tedious and back-breaking job of forming the harbour side road had only just begun. Otago’s only tangible link with Maori wars in the North. This lengthy historical monument was constructed by prison labour, the majority of who were Maori prisoners, sent south from the North Island campaigns in an effort to break up the Northern tribal systems. The prison labourers were housed mainly in a hulk moored in the harbour: from there they rowed daily in open long boats in all kinds of weather to the various points of road construction; it is believed however that what is now the cap-park area at Glenfalloch was used as a temporary barracks while work was in progress around there. All the stone in the sea wall is hand faced and set, and has stood the test of time and surge of tides, visual proof of the blood and sweat of those hapless workers, many of whom had never seen stone masonry tools before in their lives. Because of this lack of access as mentioned, George Russell had his own steamer the “Moerangi” and commuted to and from Dunedin in it every day and to St Paul’s for Church every Sunday. The remaining stone foundations of the steamers moorings can still be seen at low tide directly below the Glenfalloch Homestead in Russell Bay. George Russell was also keen on horses and this was another of his reasons for establishing himself on the Peninsula: he became a well known sight when driving to town on an immaculate highly polished black lacquered landau with gold trim drawn by a pair of equally immaculate matched Blacks. Russell was a commanding figure in black frock coat, black trousers and spats and his ever present high-domed Homberg, which he never seemed to be without, it was even said that he had it on while he slept. Russell installed tow horses troughs on the harbour road – one at “Elrick” and the other at “Vauxhall”. The Vauxhall one was carved from a solid piece of stone and has since been removed to a site adjacent to Glenfalloch’s car park. This trough it was said had very little use as the water from the spring that fed it was too cold for horses to drink. The turn of the Century saw a change in George Russell’s life: Mrs Russell had never been happy with the Colonial way of life. She found the bright lights of London too hard to resist and so headed back to the “old country”. Russell then closed up Glenfalloch leaving only a skeleton staff on the property overseen by Mr Roy. The Misses Roy remembered highlights of their stay at Glenfalloch. Washing day was not only for the household laundry, but for Russell’s five dogs. The original washhouse was a large affair with an enormous wood fired copper with steps up to its rim – the hot water in turn being run down ducts to a number of tubs. After the wash was done and hung on lines on the “Bleaching Green” behind the Homestead, the two girls then set to bathing the dogs in the used suds, just who ended up the wetter was difficult to judge – needless to say the girls were very fond of the dogs and visa versa …. George Russell would be taking the dogs for a walk when they would desert him for the children. “You little monkeys – taking my dogs away from me” he would say. Russell fed his dogs on meat and boiled rice. Christmas meant gifts of picture books for the girls from him and Mrs Russell would give them dolls. He spent the rest of his stay in New Zealand at Dunedin’s Fernhill Club until he returned to England around 1900. He died in “Bournemouth” aged 99 years. In 1917 when Philip Barling purchased the property form George Gray Russell it had lain idle and undeveloped for some 20 years with only the buildings etc being cared for by the Roy family and Managers. Barling had been honourably discharged from the Boer War and was fresh from his native “Hurst Green” in Kent and by no means wealthy, but his intuitive vision and a deposit of two hundred pounds were to be the corner stone of one of New Zealand’s best known gardens. He was a keen gardener, with a love of all growing things and a wide knowledge of trees and bush craft. His ambition was to recreate an English landscape on the opposite side of the world – no mean ambition for a labour force of one when you consider the size of the property. He soon discovered the refractory, though fertile nature of Otago Peninsula soil, hundreds of loads of sawdust and coke breeze were brought in to break down its tenacity and bring it to a condition where choice subjects could be planted and grown successfully. Barling also purchased land at Outram and enriched Glenfalloch with lorry loads of Taieri loam. His gardening methods were not wholly conventional; local residents were concerned and shaken when loud explosions were regularly heard from the property in the early days, but fears of an uprising were allayed when it was discovered it was merely Barlings method of loosening the hard clay pan with dynamite to plant Monterey Pines, many of which still girdle the property and are upwards of 150ft high. Phillip Barling married Pearl Brent from the Taieri before coming to Glenfalloch, she was a forthright and determined lady and together they set about transforming Glenfalloch to the English landscape requirements Phillip longed for. Oaks were planted by the hundred along with equal quantities of elms, ashes, walnuts, horse chestnuts, birches and beech: add to this drifts of blue-bells primroses, hosts of daffodils and the odd briar rose and the Anglo-Saxon recipe is complete – but not quite, we need a Manor house to finish the scene, George Russell’s weather-boards and corrugated iron didn’t look quite right. The first alterations were to the downstairs windows which were changed to casement – bays glazed with diamond-paned leadlights. Then the upstairs double-hungs were altered to mullioned casements. Final work on the homestead transformation happened in the late 1920’s and 30’s with its rough-casting and re-roofing with Marseilles type clay tiles. The Barlings were also pioneers in another field – food: They had opened their original Savoy Restaurant in Dowling Street in the 1920’s. Prior to this move Phillip had suffered an illness and for his recuperation had the side verandah at Glenfalloch closed in and glazed and it was from this sick bed retreat the he designed the interiors of the Tudor and Warwick rooms – again very reminiscent of his English background. Taking tea at the Savoy was a must – a delightful and most fashionable experience, not only for the surroundings and food, but for fresh flowers ever present – a feature it became famous for. Naturally enough they were grown at Glenfalloch and in great quantities. The present car-park and court areas were devoted to annuals of all types and many of the beds and borders now occupied by Azaleas and Rhododendrons were then filled with masses of herbaceous plants, all for the picking. The Barlings also ran a florist shop in the city ‘Floriana’. As George Russell’s magnificent carriage and pair was a sight earlier residents would remember, so too was the Barlings Monday morning run to town – picture if you can a large Hudson tourer filled to over-flowing with baskets of flowers, 3 children and “Nanny” in the back, Phillip at the wheel and as usual Pearl reigning supreme over everything – a sight not to be missed, so I’m told. The return journey to Glenfalloch quite often had a fragrance of a different nature. Philip raised and fattened pigs on the property and more often then not his cargo was slop tins from the Savoy. Another of his side interests during the war years was his “Fat for Britain” campaign to help the soup industry there: this earned him and OBE. The Barlings search for beauty stretched beyond the gardens into the Fine Arts and especially things eastern. This love for the exotic again reflects itself in the original garden and pond, this area was originally George Russell’s berry garden, full of blackcurrants and raspberries. Barling imported many trees and shrubs and in later years referred to Glenfalloch as his horticultural league of nations with many countries represented all growing side by side in harmony. Philip senior died in 1956 and his son James took over Glenfalloch while his other son Phillip ran the Savoy. The terms of Barlings will dictated that the property be offered to the City but the then council turned the offer down and James decided to purchase the estate and make it self-supporting. Earlier when on his final leave before the Second World War James planted the first Rhododendrons on the property along with Azaleas, the seed of which come from the Stead’s property “Ilam” in Christchurch. He consequently developed this part of the garden and now there are masses of blooms in the season, a lot of them were unique in New Zealand. Even while he was away at the war, James Barling was planning improvements and additions. He recalls that the day before El Alamein he sat in his slit trench and, to take his mind off the boredom, the heat the sand and the inevitable flies, he concentrated on working out new developments for ‘Glenfalloch’. At Cassino he lost a leg – but none of his enthusiasm and the property now bears the indelible stamp of his talent and industry. Until the death of old Philip, Glenfalloch had remained somewhat of a mystery to the casual passer – what lay beyond the tunnel of macrocarpas at the drive entrance was only known to the invited or those lucky enough to visit for a church fete on daffodil day. In 1957 the gates were thrown open wide for anyone to enter, as long as you had two bob in your pocket. Jim converted the old stables and coach house into a Swiss Chalet tearooms and then expanded the tennis court pavilion to form the Pinewood Cabin, reminiscent of California in its construction with knotted pine interior and appropriate decoration – it was a favourite venue for parties and weddings. A large central stone fire-place was a dominant feature providing warmth and a congenial atmosphere. Other of his innovations included an outdoor badminton court, classical music piped into the gardens, a giant draughts game, pony and donkey rides, the big swing over the main road and the swimming facilities and raft in the harbour, most of which are gone now. The Queen Mother visited and commented that Glenfalloch was a beautiful place that made her feel as though she was back in England. Jim and his father were keen members of the “Men of Trees” movement and couldn’t resist the challenge of a bare slope to plant with trees. Jim’s other interest was Art Photography, concentrating mainly on the female form, many examples of his work were to be seen in the Gallery until he sold the property in March of 1960 and moved to London where he became well known for his oil paintings. He died in January 1980. Gordon and Stella Mills bought Glenfalloch in March 1960 and shifted in June of that year, but connections between the Barling’s and Mill’s although fleeting, are memorable, for Gordon at least. As a young man in his 20’s working on the new Regent Theatre building he was to meet Philip Barling senior in rather unusual circumstances. A brilliant flash of colour shot across the city sky, electric blues, vivid greens, and fiery reds disappearing into the First Church macrocarpas followed closely at a panting trot around Moray Place, by Phillip Barling’. “Did you see my bird” “where did my parrot go”? By now Gordon had guessed that it was some exotic avian creature. “It’s in the First Church trees, will I get it for you”? The reply was affirmative! Being an agile tree climber Gordon had the parrot captured in short order and restored to its grateful owner. It was the Macaw that used to greet visitors from its perch inside the Warwick room door of the Savoy. “I am most thankful to you young man” said Barling. “You and a friend must come to the Savoy and dine some time at my expense”. This invitation was willingly accepted. But that wasn’t to be the end of the story: 40 odd years later Gordon was to be confronted by the same bird not in all its feathered glory, but immortalised by Charles Brook in stained glass in Glenfalloch’s Homestead entrance hall. The Mills were avid horticulturists – caterers they were not! Until now providing food for Glenfalloch’s patrons had been fairly bland. Fresh scones and teas, and the odd cold buffet or barbecue supper for socials. But people will persist in getting married and Glenfalloch proved to be a popular venue. “Two hundred souls for the wedding luncheon” a startled Stella exclaimed – alright! – I’ve looked after five mouths for nearly 30 years, let’s just multiply it. And she did with great success, cold meats, salads and hot vegetables, a good rib-sticking menu that no one could complain about. Like the Barlings, unplanted slopes offered a challenge to be developed with boulders of enormous weight and size being re-sited from Cape Saunders to Glenfalloch. Roses have always figured in the Mill’s lives and to this end another bare slope above the Chalet and up to the Pines was ultimately terraced and planted – labour in the main being supplied by Gordon. Macrocarpa and Pine, which were becoming a hazard on the road side, were felled one hundred years after Russell planted them, to become risers and treads, pillars and beams for the new works. The work area of the Chalet and Cabin were rebuilt and antiquated coal-fired cooking stoves were replaced with something more in tune with present day requirements. Unfortunately George Russell’s adapted stablery and grooms quarters were to be razed to the ground by fire in 1976. During these years the novelty value of Glenfalloch was a tremendous draw-card to dedicated gardeners and pleasure lovers alike as extracts from a visitors book of these early years suggests. “If heaven is like this I hope I make it” writes one. The superlatives run on while one visitor implied the utmost in New Zealand praise: “The only thing wrong is that it’s not in Auckland”! So much in this garden of quietitude and many charms: so much to absorb and enjoy, no wonder upwards of ninety thousand people a year came to see it. Mr and Mrs Mills however were no longer young and the garden was beginning to present problems of maintenance which worried them. The idea of a responsible body taking over the garden, installing a capable garden Superintendent and staff, appealed to them and with these thoughts in mind they conceived the idea of Trust Control in 1967. The Trust was formed with the help of Dunedin Jaycee President Robin Archer and the drive of inaugural chairman, Gordon Parry. From then the Trust has gone from strength to strength even though dogged by ever present problems of finance. Its work is not just confined to Glenfalloch but covers the whole of the Peninsula. Native fauna and flora were looked after by the Wildlife committee, caring for the re-establishment of native trees and plant-life so important to act as cover to attract bird-life and sea mammals back to their traditional haunts, yellow-eyed penguins, fur seals, bellbirds, tuis, robins, warblers, creepers even the tree geckos. Noblest of all however the Royal Albatross, with its colony at Taiaroa Head. Until recently this had been accessible only to the privilege few, visiting Royalty, and Ornithologists etc., but now with the Trusts help it is open for all to view. Naming and locating historical sites on the Peninsula was another of its activities, like the Pyramids, and the site of New Zealand’s first Cheese Factory, Lovers Leap, the old Lime Kilns at Sandy Mount and the disappearing gun at Taiaroa Head. Work for the Otago Peninsula Trust is another and its members is a constant challenge. Today the grounds of Glenfalloch are over-seen by the Head Gardener, assisted by the gardening team whose task it has been to plan and execute the expansion and replanting of the 11 hectares under their jurisdiction. On the right of the main drive is a grove of deciduous English trees carpeted in the spring with primroses and daffodils. Under their spreading branches, happy in the intermittent shade and hungrily devouring their diet of fall leaves, the Grand Parade of rhododendrons and Azaleas begins. A hustling creek makes its way over the last few hundred yards to the Harbour, and it doesn’t matter which path you take from the valley you are sure to find more rhododendrons ………….a veritable forest of them. “Gigantum” flaunts its bright pink bells in clusters bigger than a rugby football “Cornubia” follows with its show of scarlet and after that beautiful specimens from all over the world. The charming mauve “Chasmanthum”, white “Lindleyii”, “Scarlet King”, Edith Cary”’ Irene Stead” (NZ Grown) “Unknown Warrior, many of the Loderii’s and the falconerii species. These are names of just a few. Various varieties provide continued interest right through to January when a gorgeous creamy-white rhododendron shows off among the hydrangeas. “Ilam” azaleas bloom in October and November … great shaggy masses in all shades of red and yellow and as their season advances they via for pride of place with the showy curtains of Deutzia and Kolwitzsia. Fluffy blossoms of flowering cherries hide the sky for a while then shed themselves so that you walk along a path covered with a soft pink carpet. A short distance along one of the paths will take you to the Oriental pool and here you will see real horticultural artistry. It is completed with hump-backed bridge, a little island with a stunted tree, a tall juniper coffin pine is there too. You may go further through native bush and ferns to the waterfall, or you may turn back by way of the grove of more English trees. In the Spring this part is carpeted with yellow primroses and blue bells, and hard on their heels come the daffodils dancing and prancing in the breeze. The main drive sweeps around past the house with the lawn to the right and the ornamental pool and fountain adding a touch of formality. Clumps of English snowdrops, crocuses and aconities are everywhere along the borders in the early Spring and all through the year the Rock garden in front of the house is continual source of interest. There are native birds a plenty. The calls of the Tui and Bellbird are especially beautiful in this setting and all through summer the shining cuckoo and gray warblers make music. Then there are the hydrangeas. Those bloom at the time when the main flowering of shrubs is past its best. There are masses of them at Glenfalloch and as the property is sheltered from frosts these go on flowering from early January until they are pruned during the winter. Lilies grow well at Glenfalloch, the woodland setting suits tem admirably and visitors are fully appreciative of their serene beauty. Apart from the more common varieties there are colonies of “Gigantum” whose huge ivory coloured blooms appear at Christmas. The Fuchsias are a special feature in the autumn scene. Like the hydrangeas they flower all through the winter until they are pruned in early August. All the beauty that goes to make up the Glenfalloch Garden is regarded by its present owners, The Otago Peninsula Trust, not so much as a personal possession but as a place they are pleased to share with the thousands of people who visit it each year and find a measure of happiness in the quietitude and peace.